On Sunday, February 17th the Alternator Centre for Contemporary Art will host the B.I.G Beer Festival at BNA Brewing Co. A selection of new and vintage beers available to taste from small brewers and limited batches. Tastes will be focused on Barrel-aged, Imperials, and Grogs. Featuring vintage beers by Steel & Oak, Driftwood, The Bruery and more! Tickets are only $25.00. Three tokens are included in the ticket price. Additional tokens will be available for purchase on the night for $2.00/each. 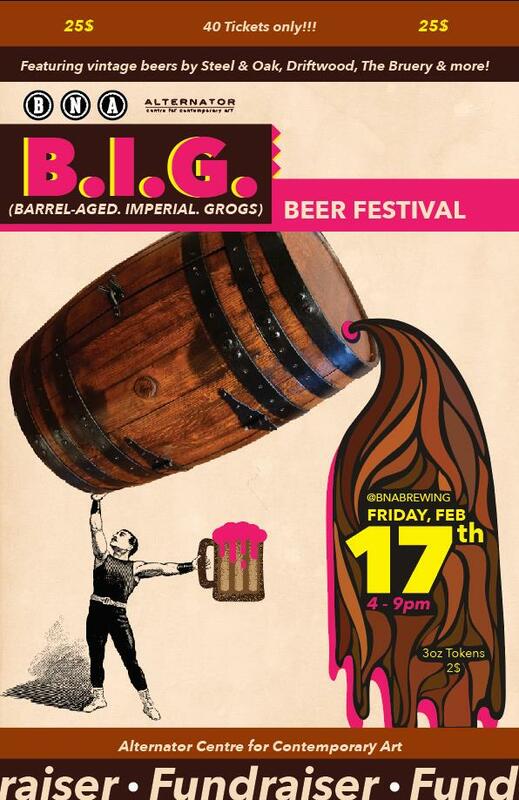 The B.I.G Beer festival will run from 4pm – 9pm at BNA Brewery Co on February 17. All proceeds go to the Alternator Centre for Contemporary Art. Must be +19 and up.